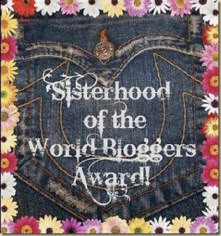 I am honored and humbled with the nomination for the “Sisterhood of the World Bloggers Award” by the fantastically lovely blogger Isleofazure. Please do check out her blog she has a ton of information, DIY recipes, write-ups about challenges, photos, the whole nine yards. Once again Thank You for the award beautiful! What do you love most about natural hair? EVERYTHING lol! I can’t pick one thing so: I love how versatile it is, I love that it is all MINE & I am proud of the progress I have made since going natural. What are 3 hair products you cannot live without? Water, leave-in conditioner and oil. Who was your best supporter when you returned natural or while currently transitioning? My whole family. My parents always wanted me to grow my own hair so when I decided to stop using relaxers they were happy. My sister went back natural before me so of course she supported me as well. Which is your all time favorite Bond Movie? I honestly am not the biggest Bond fan (don’t hit me) 😀 But if I pick one it would be an oldie “Live and Let Die”. If you had to choose, which would it be, A. Silver, B. Gold C. Platinum? Why? Silver, I feel like it compliments my skin better than Gold and Platinum is just too expensive (here where I live). What made you start blogging/vlogging? What do you enjoy the most about blogging/vlogging? Tell us something none of your bloggers/vlogger know about you (yet)? What is your most dreaded petpeeve? Where do you prefer living: the city, countryside, suburbs? If you could pick any profession in the world what you do? This entry was posted in Blogger award and tagged Blog Awards, Blog Nominations, Sisterhood of the World Bloggers Award on October 9, 2014 by Maicurls.